Can Oatmeal Help Manage Diabetes? Diet plays an important role in managing diabetes. Oatmeal, used for long as a breakfast food can help with diabetes in several ways. Learn how to eat oatmeal. Oatmeal has been commonly used as a breakfast food for long. Oatmeal is prepared from oat groats, which are kernels of oat that have their husks removed. The oat groats used to make oatmeal are typically steel cut (chopped), instant or rolled. It is cooked while mixed with a liquid and served warm with add-ons such as nuts, fruit or sweeteners. You can prepare it ahead and reheat in the mornings to get easy and quick breakfast. How are oatmeal and diabetes connected? Let’s find out. Diet plays an important role in controlling and treating diabetes. Foods rich in fiber including oatmeal help to maintain levels of blood sugar and to reduce complications of diabetes. Glycemic index is indicative of how fast a particular food increases your blood sugar and plays an important role in managing diabetes. Foods including oats have low glycemic index; therefore they keep glucose levels balanced for better control of diabetes and prevention of complications. 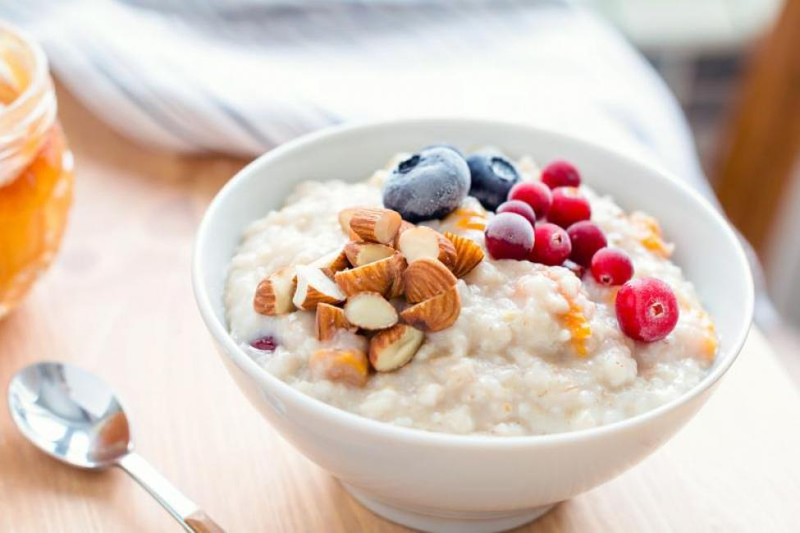 Oatmeal causes this effect as it increases the thickness or viscosity of the stomach contents, slowing digestive process and prolonging glucose absorption into the blood. This also provides your body a long-term, stable energy source. People who have diabetes also suffer from a raised risk of developing high cholesterol. Beta-glucan, which is a type of soluble fiber, is present in oatmeal that helps in lowering blood cholesterol. This happens as soluble fiber of oatmeal and other foods that are rich in fiber forms a gel-like compound in the small bowel, trapping the unhealthy cholesterol present in foods and preventing it from getting absorbed in the body. However, this compound does not trap the HDL or good cholesterol. What is the connection between oatmeal and diabetes? Oatmeal is a food that is good for the health of heart. This is especially important for people suffering from diabetes as they are at an increased risk for developing heart disease. Apart from lowering cholesterol, oatmeal also contains lots of potassium, which helps in reducing hypertension and maintaining the health of blood vessels and heart, thereby preventing heart disease. An important part of management of diabetes is nutrition, which can help decrease the requirement for treatment using insulin and medicines. A study conducted in 2008 demonstrated that patients having diabetes who followed a diabetic diet could manage their blood sugar levels at around 158 mg/dl. When they added oatmeal to the diet, it further reduced their blood sugar levels to around 118 mg/dl. It was further reported by the research that these nutritional changes resulted in around 40% decrease in dosage of insulin, which is required to achieve the controlled blood sugar levels. What is the link between oatmeal and diabetes? For majority of the diabetic patients, eating oatmeal does not cause lots of side effects unless you eat versions that have lots of artificial flavorings and sugar. Oatmeal can cause severe side effects in people who have gastroparesis that is characterized by delayed emptying of gastric contents. For people who have gastroparesis and diabetes, high fiber content of oatmeal may be harmful. Bloating, because of high fiber in oatmeal. You can reduce the effect by drinking lots of water. Flatulence because of high fiber content. Drinking lots of water while you eat can help in reducing flatulence. The added ingredients such as extra sugar, flavorings, or sweeteners present in instant oatmeal packets available in the market may be harmful to a diabetic. Oatmeal when prepared in the correct manner and added to a diabetes diet can help in the management of diabetes. While adding oatmeal to your diet, there are many things that you shouldn’t or should do to maintain its health benefits. There are many dos that can be added to the preparation list of your oatmeal to increase its positive health benefits. Consume oatmeal with a healthy fat or protein such as nuts, Greek yogurt or eggs. Add 1-2 tbsp of chopped walnuts, almonds or pecans to your oatmeal. It can add healthy fat and protein, which can help in stabilizing blood sugar. Opt for steel cut or Irish oats as they have greater quantity of soluble fiber that helps in regulating blood glucose. Use cinnamon, which has anti-inflammatory properties, is rich in antioxidants and help in reducing the risk of cardiovascular disease. It also helps in improving insulin sensitivity and lowering blood glucose levels. Add berries to oatmeal. Berries are rich in antioxidants and other nutrients. They also act as natural sweetener. Use water or low-fat milk to prepare oatmeal. Low-fat milk increases nutrients without increasing the fat content. However, remember that the total quantity of milk used has to be calculated while calculating the total carbs of your meal. 8 oz of regular milk has around 12 g of carbohydrates. As there are numerous excellent choices that diabetic individuals can make while preparing their oatmeal, there are numerous choices, which may prove to be detrimental to them. Avoid using instant or prepackaged oatmeal that contains added sweeteners. Flavored and instant oatmeal often contains lots of added salt and sugar, both of which are not good for a diabetic diet. These types of oatmeal also have low amount of soluble fiber. Opt for a variety of oatmeal that is listed in do’s section. Avoid adding lots of dried fruit as a high amount of carbs are present in small portion of dried fruit. Take care of your portions. Don’t add large amount of sweetener. People usually add honey, sugar, syrup or brown sugar to oatmeal; however, this reduces the health benefits of oatmeal that it offers to diabetics. Avoid or limit the use of cream. Instead use either skim or low-fat milk or water to prepare oatmeal.